Our New Pink Wool Coat is made with 100% Wool. They are extremely high-quality coats that are both warm and fashionable. It features Pink and Black ribbon accents and a thick faux fur Black Collar. It comes fully lined. 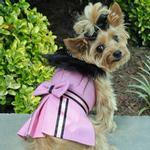 Our wool coats all include a matching leash and the product has a built in D-ring for easy walking.